M.H. Abrams is not a late bloomer. He published his first book at age 22 and has published every decade of his life since. His latest is a book of essays, slated to come out from Norton in the fall, called "The Fourth Dimensions of a Poet." Today he was scheduled to give a lecture on the subject at Cornell University where he began teaching in 1945. No, Abrams is not a late bloomer. He's is a non-stop bloomer. Tomorrow is his birthday. He will be 100 years old. Yes, at 100, Abrams is still lecturing and writing and publishing and pursuing a life-long love of literature. "I go back far enough so that when I was a college student I heard T.S. Eliot, Ezra Pound and e e cummings read their poems. Each read differently but all read well. I heard Robert Frost talk his poems to great effect. And I heard Dylan Thomas recite poems in a Welsh bardic chant to an equal or greater effect," Abrams reminded his audience last fall. If you went to college, and especially if you were a lit major, you most likely bought this work of Abrams: The Norton Anthology of English Literature. Abrams was the founding editor of that mainstay of English Departments on college campuses across the country. Many of us still can't part with our dog-eared copies. The sight of my husband's battered Volume I hardback on his bookshelf was one of the reasons I fell in love with him. Abrams also wrote two major works of contemporary literary criticism: "The Mirror and the Lamp: Romantic Theory and the Critical Tradition" (1953) and "Natural Supernaturalism" (1973). Among his students at Cornell were Harold Bloom and Thomas Pynchon. But this is no stuffy professor. When Danielle Winterton of the Ithaca Times, recently asked Abrams who we should be reading now, there wasn't a dead white man in sight. Sounding more like a hip, up-to-date literary critic than a professor emeritus, Abrams recommended the novels of Gillian Flynn. Flynn's latest is the popular thriller "Gone Girl." Abrams' life is the "model of the intellectual journey in which every stage breaks new ground," Roger Gilbert, the chair of Cornell's English Department, told the Ithaca Times. "It is incredibly moving and inspiring to see how he has insisted on remaining engaged, thinking new thoughts, and being aware of what is happening in the world of literary studies." Abrams was never much for resting on his laurels -- or resting at all. He continued to renew and update his anthology, throwing out old names and adding new ones. Each new edition -- it's now on its 10th -- has been "a collaboration between editors, users, teachers, and students,"Abrams told the Ithaca Times. "That's the way to keep the thing vital and alive and current." The formula is working: more than 50 years after Adams launched it, the anthology is thriving. Abrams obviously has kept himself vital, alive and current as well, although he doesn't see reaching the age of 100 as much of an achievement. "It's nothing I worked on, I assure you," he told Winterton. "I don't know why people think you somehow deserve it; you don't deserve it or not deserve it; it happens to you." Born in 1912, Abrams never let anything -- not even the Great Depression -- prevent him from following his dreams of becoming a literary critic, a professor, a thinker. "Abrams has often said he choose English as a field of study because there weren't any jobs in any field at the time, and he figured he might has well starve doing something that he liked instead of starving while doing something he disliked," writes Winterton. 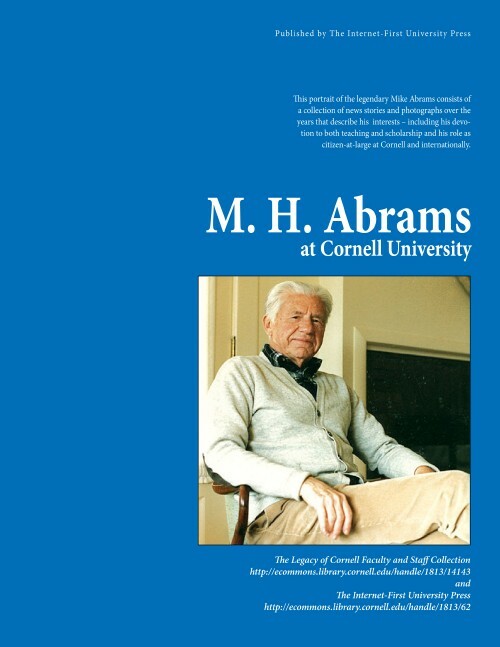 Today, in celebration of its centenarian scholar, Cornell also scheduled an "Open Mike for Mike," to let friends, students, colleagues and admirers pay tribute to Abrams for his birthday. Among those who sent in tributes and birthday wishes were Bloom and poet Robert Pinsky. Fellow literary critic E.D. Hirsch, Jr. posted what he called one of his favorite Abrams-ism: Good criticism requires "a keen eye for the obvious."